Whether you're of Irish decent or not, there is no shortage of fun to be had on Saint Patrick's Day. This mid-March holiday commemorates Saint Patrick and celebrates the heritage and culture of the Irish. Grab your green, fill your cup with suds and put on your dancing shoes, because the Irish sure know how to party. Many cities throughout the United States have formal Saint Patrick's Day celebrations, but none more bizarre and exciting than Chicago. Complete with marching bands, bag-pipe players, ceremonial services, contests, parties and a variety of Irish festivities, the Windy City adds one additional element to this day that certainly spreads the holiday cheer. For almost 50 years, a group of privately funded St. Patty's advocates have been pouring 45 pounds eco-friendly vegetable dye into the Chicago River to turn it a shimmering shade of emerald green. 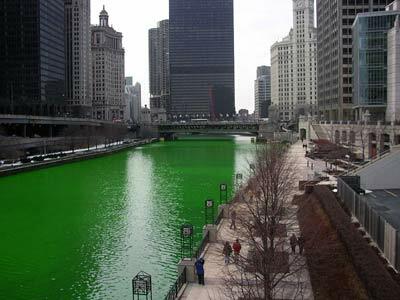 The dyeing of the river draws nearly 400,000 viewers each year, allowing spectators to revel in the colors of old Saint Patrick. Seeing as though the Windy City has a firm handle on how to make a splash, CityPASS is parting the sea of green to help you plan out your St. Patty's Day attack on Chicago. The parade kicks off on March the 15th at 12 p.m. Don't worry about taking your wallets out, however; the celebration is free of charge. 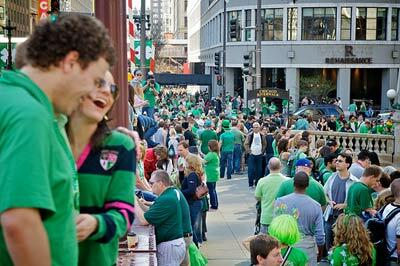 Chicago plays host to one of the largest St. Patrick's Day parades in the country, brimming with a wonderful collection of colorful floats, Irish step dancers, marching bands, bagpipers and more. The parade will go, on rain or shine. If you're looking for a particularly comfortable place to take in the sights, we recommended setting up camp towards the start, near Grant Park. Quigleys Irish Pub: Located at 43 E Jefferson Ave., Naperville, Quigley's offers live music, more than 20 beers on tap and dozens of your favorite Irish bar snacks. O'Shaughnessy's Public House: Situated at 4557 Ravenswood Ave., O'Shaughnessy's bar owner hails straight from the Emerald Isle, so this pub offers no shortage of true Irish heritage, beer and food. O'Rourke's Office: If you find yourself on the South Side of the city, be sure to stop into O'Rourke's Office for a great selection of beer and house-made cocktails, located at 11064 S Western Ave. When you're throwing on the kilt and stringing up the bag pipes, be sure to take in some of the aforementioned sights and sounds to ensure a fun and enjoyable St. Patty's Day celebration. If you're in town for a long weekend, don't forget to take in the other great Chicago tourist attractions.